EAMT is located in the centre of Tallinn (Tatari 13) and is one of the most functional music education facilities in Europe. 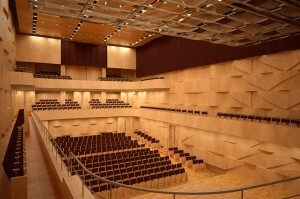 In the main building of EAMT there are 7 500 square meters of usable space designed and built especially for the higher musical educational establishment. There are 60 classrooms plus 14 rehearsal rooms where classes can be held. Special mention should be made of the EAMT’s small chamber hall, which seats 130–200, a choir class combined with a big auditorium for 77 students, an audition room for 40 persons with a new baroque organ, the opera studio, the electronic music lab and recording studio, a library with computer facilities, and a students dining hall. The building meets the highest acoustical requirements, boasting soundproofed rooms with options to adjust any given room’s acoustics exists by adding or removing wall panels. Over the next couple of years EAMT shall build a new hall complex next to its current main building to further improve the educational environment of the Academy, raise the quality of education, expand domestic and international cooperation, and increase the visibility and impact of the Academy in society.